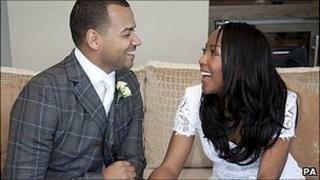 TV presenters Angellica Bell and Michael Underwood have tied the knot in New York, a spokesman for the couple has announced. The pair, who got engaged in the city on Christmas Eve last year, surprised friends and family with the announcement earlier this week. Underwood chose a tartan Vivienne Westwood suit for the wedding, while Bell wore a twenties-style white dress. The couple first met when they were children's TV presenters for the BBC. Underwood, a former Dancing on Ice contestant, said in a statement: "Having got engaged in New York last year, we thought it would be fitting to get married in the same place." Bell announced her nuptials on Facebook writing: "You can call me Mrs Underwood." She later added: "It was a magical day." The couple, who currently co-host ITV1's The Zone together, are expected to extend their trip in New York to allow for their honeymoon.